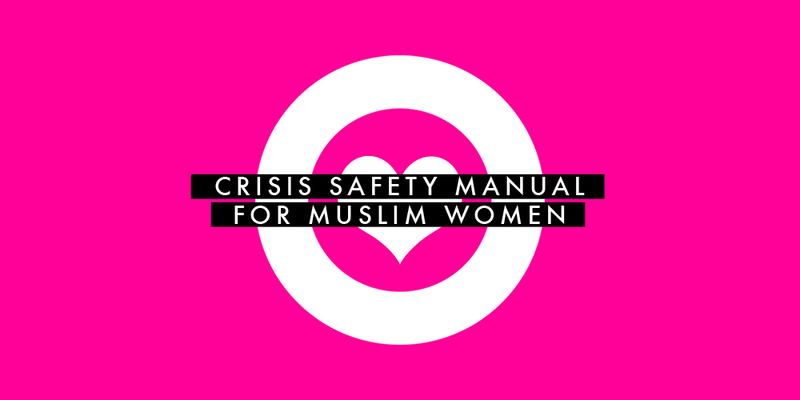 This Crisis Safety Manual has been edited for clarification. An earlier version may have misled readers to believe that we recommend removing the hijab. While we at Muslim Girl believe that the safety of Muslim women is the utmost priority, we do not believe that women should feel pressured to either remove or wear their scarves. If you believe your wellbeing is under direct threat, please take every precaution necessary to stay safe and contact 911 in case of an emergency. With the influx of Islamophobia-related crimes in the United States these past few months, it can be an extremely scary and nerve-wracking experience to leave home and brave the world as Muslims today. Because of the crimes of extremists across the globe and right here in the U.S., Muslims are being unfairly given the assumption and stigma of being suspicious, dangerous and a higher risk to those around them. With the addition of online hate, anonymous phone calls and protests outside of religious institutions — we shouldn’t feel as unsafe and on edge as we have to be now. It is vital for us to keep in mind that we are in no way, shape or form responsible for all the extremism and atrocities that are occurring globally and we have nothing to personally apologize for as Muslims. However, as Muslim communities face backlash from the ignorance caused by the media, extremists in the name of our beloved religion, along with bigots who simply look for an excuse to show their racist colors, it is crucial that we all take the necessary precautions and keep safe. Despite our disappointment that this list needs to exist, we’ve gathered some tips on how to keep yourself safe in public, at home and on your way to work. Perpetually stressed and in need of Chocolate. Stockton University MSCD Class of 2018 - I help people use their voices.